A person's home is his or her sanctuary, a place to feel comfortable and safe. Unfortunately, crime in the form of home robbery can lessen that sense of security and heighten feelings of vulnerability and even fear. According to FBI crime statistics, burglary accounts for 23 percent of all property crimes in the United States. In addition, nearly 75 percent of all burglaries were residential. Home burglaries often happen during the day, when people are away at school or work and homes are for the most part empty. Although burglaries can happen at night, they will most often occur when the chances of being seen, interrupted, or caught are the lowest. Criminals seek out items that they can remove from one's premises quickly and that can be quickly and easily sold for cash. Fortunately, there are ways that people can make their home environment a safer one and reduce their risk of becoming a statistic. One of the simplest and most effective ways to protect one's home is to lock all doors that lead into the interior, including the garage. In order to do this, one must have the right type of doors and locks in place. Entryway doors should be of metal or have a solid core, particularly when they are front doors or at other entrance locations. Locks and strike plates are important to prevent doors from easily being picked or kicked in. A heavy-duty strike plate should be installed using screws that are long enough to secure it into the stud of the door frame. Three inch screws are generally sufficient to accomplish this. Deadbolt locks should be a deadbolt that comes with a throw bolt that is one inch thick. They should be of the highest quality as either a Grade 1 or 2. Peepholes are another security feature that is invaluable because it allows people inside the home to see who is at the door without having to open it. Just like doors, windows should remain closed and secure when a home is empty and during the night when people are asleep. The latches on windows can be easily opened and for this reason it is a good idea to place a wooden dowel or some other object in the window frame to prevent the window from sliding open too widely. Sliding patio doors should also have a secondary device present to prevent them from opening fully. In fact, windows should only be allowed to open no more than six inches. Using anti-lift pins on older patio doors can help prevent someone from removing sliding patio doors entirely. On both patio doors and windows the use of warning decals can deter thieves. Decals may warn thieves of the presence of a dog, an alarm system, or of a neighborhood watch program. Both exterior and interior lighting are effective deterrents when it comes to burglars. The cover of darkness is appealing for would-be thieves who can scope out and enter a home with the reduced risk of being seen by neighbors or passing cars. Darkness is also a beacon that alerts criminals to the potential vacancy of a home. When away from the home at night, the use of light timers can give the appearance of someone being inside. Light timers should be set to turn on and off at random times in various rooms in the house. Timers may also be used for turning on and off televisions and radios to further give the impression that there is someone occupying it. Outside lighting is equally important as indoor lighting. Appropriately placed lights can illuminate dark corners where criminals may hide in wait for homeowners. A well-lit home can deter criminals altogether for fear of being seen. These lights should be timed to turn on at dusk and off at dawn. Another popular option is to install motion or heat detection lights that will turn on whenever movement or body heat is detected. When purchasing exterior lights, people should look for lights that illuminate up to 100 feet. An alarm can be an effective deterrent, particularly when its presence is advertised by a sign on the lawn or in one's window. As previously noted, burglars do not want to bring attention to themselves when breaking and entering a home. The sound of an alarm will not only garner the attention of people living nearby, but most systems are tied into the alarm company or the police. For the most effective deterrent, one should choose an alarm that sounds out loud with a bell or horn. Silent alarms may notify the police, but the robber will not be deterred and can potentially make away with one's belongings. One should also choose a professional alarm company to install and help program the system. Everyone mature enough to operate the alarm in the family should be taught how to do so. Establishing a good relationship with one's neighbors creates a new and invaluable level of home security. This should be based on trust and a mutual agreement to keep an eye out for any suspicious activities. Ideally, this relationship should be established with the neighbors to either side of a person's home and the neighbors living in the homes within view across the street. 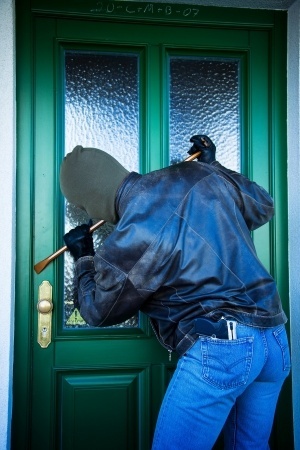 Neighbors can contact one another or the police if they are concerned or are witness to a burglary in progress. They can also help prevent burglaries from occurring by helping neighbors when they are vacationing or away from the home for any length of time. Picking up newspapers, mail, and even parking in a second car in neighbor's driveway periodically, can help keep a house from looking unoccupied. As opposed to hiding a spare key in a "secret spot" that can easily be found by a burglar, such as under a mat or false rock, one may choose to provide a neighbor with a spare key for emergency purposes. This key can also be used to help police enter the premises. One way to protect one's valuables from routine robbery is to purchase a safe. Safes are designed to secure one's most valuable belonging so that they are not easily grabbed during a robbery. Safes are heavy and anchored to the ground, preventing a robber from picking it up and carrying it from the home. Home owners should keep their codes secret and change it often so that no one has access or the ability to open it. Typically, an average robber will not take the time to crack a safe as the goal is often to get in and out quickly. Not only does it protect one's belongings from unknown burglars, but it also protects them from anyone who may be dishonest or curious in the home, such as a babysitter or even one's children. Not all items, however, are capable of fitting in a safe. While it may not be possible to prevent larger items such as computers or televisions from being stolen, it is important to identify them in the event of recovery. There are several ways that people can go about this. One is to keep good records of their belongings in the form of receipts and photographs. Receipts are vital in proving the value of an item, while photographs are used as proof of ownership. When photographing items get clear images and make note of the serial numbers, brand and specific model either on the back of the photograph or on a separate list. These items should be stored in a safe location, preferably in a safe deposit box or safe. Another valuable way of identifying one's belongings is to engrave them with one's driver's license. Burglary Prevention: Burglary prevention tips on the Jefferson County Sheriff's Office. Tips regarding light, noise, and locks are included on the page. Crime Prevention Tips – Burglary: Watch a video on how to prevent home burglaries. The tips are presented via video and written text. Crime in the United States – Burglary: The Federal Bureau of Investigations report on burglaries for the year 2012. This page includes an overview of burglary statistics. How to Prevent Home Burglaries: An ABC news video that provides readers with tips on how to prevent home burglaries. Residential Burglary Prevention Tips: A PDF list of tips in checklist format. Tips are divided into categories, including "Burglary Basics," and "Securing the Outside." Crime Prevention - Home Burglary Prevention Tips: Crime prevention tips listed by category, starting with home burglary prevention. On the page readers will also find further prevention tips including avoiding identity theft and assault. Preventing Burglary: The Indiana Metropolitan Police Department provides this list of prevention tips in PDF format. Tips are separated by categories. Burglary Prevention Tips: Visitors here can find tips and precautions designed to help prevent home burglaries. Also, learn what to do in the event a burglary has occurred. Residential Security: An article from the Springfield, Missouri Police Department that reviews ways to improve residential security. Burglary Prevention – Physical Security and Other Prevention Techniques: In this article readers will learn ways to better physically secure their homes. Other prevention techniques such as alarms and neighbor involvement are also included on the page. Your Inside Look at Crime Prevention: A PDF brochure from the National Council of Crime Prevention. In the document readers are given information on how to prevent various types of crime. Chapter seven discusses home protection by using locks, lights and neighbors. General Home Security Tips: Use this page to review how to check the home for weaknesses and ways to improve them. In addition, the page also includes information about alarms and alarm installation. Home Security: Read information about home security by clicking on this link. The page also includes two categories: interior lighting and exterior lighting. Crime Prevention – Home Security: The five steps to reducing residential crime are discussed on the web page for the City of Carlsbad, California. People clicking on this page may also view a three-part video on the subject. Crime Prevention – Personal Safety Tips: Learn four ways to improve personal safety by clicking on this link to the NYPD website. In addition to the four tips, readers may also review advice by category including crime prevention at home.